In Gobbler’s Knob, Pennsylvania, a crowd of thousands gathered at the crack of dawn this past Friday morning to see the nation’s most famous groundhog, Punxsutawney Phil. 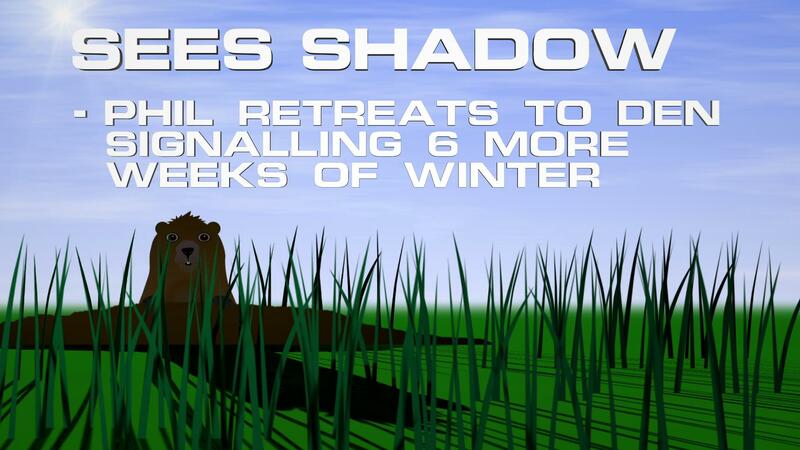 Phil saw his shadow and, as the legend has it, six more weeks of winter is in the forecast. Every February 2, Phil issues his “forecast” for the rest of winter. According to legend, if the 20-pound groundhog emerges and doesn’t see his shadow, we can expect warmer temperatures and the arrival of an early spring. But if sees his shadow, like this year, the United States can expect six more weeks of winter weather according to legend. Even though he’s been forecasting since 1887, Phil’s track record for the entire country isn’t perfect. To determine just how accurate he is, we’ve compared U.S. national temperatures with Phil’s forecasts. On average, Phil has gotten it right 50% of the time over the past 10 years. In 2017, Phil missed the mark when he saw his shadow and predicted six more weeks of winter. The contiguous United States saw above average temperatures in both February and March of last year. In February, most locations across the Lower 48 were warmer than average. Thirty-nine states from the Rockies to the East Coast were much warmer than average, with 16 states being record warm. Despite below- to near-average temperatures in the Northwest, no state ranked as record cold. Overall, it was the second warmest February on record. In March, most of the West, Great Plains, and parts of the Midwest and Southeast were warmer than average. Thirteen states were much warmer than average, with Colorado and New Mexico being record warm. Overall, it ranked as the ninth warmest March on record. In 1887, when he made his debut as the official groundhog forecaster for the entire country, Phil saw his shadow. His first prediction of six more weeks of winter was accurate for a few regions, but it came up short for several others. According to the February 1887 Monthly Weather Review Form, the Northeast, Great Lakes region, and West saw temperatures well below normal. The Southeast and Gulf states saw temperatures well above normal during the month. And, according to the March 1887 Monthly Weather Review Form, the Northeast, Great Lakes region, Ohio Valley, and Southeast saw temperatures well below normal. Areas west of the Mississippi River valley saw temperatures above normal. Predicting the arrival of spring for an entire country, especially one with such varied regional climates as the United States, isn’t easy! 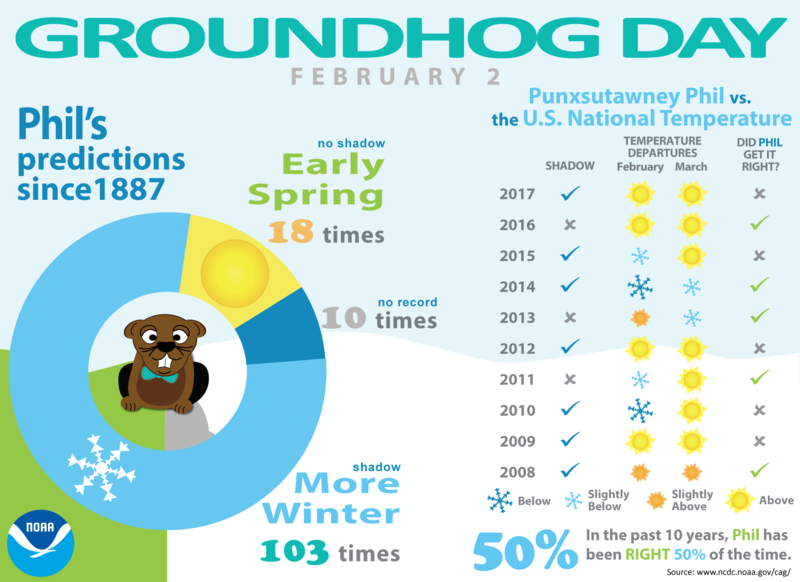 To learn more about how Punxsutawney Phil’s forecasts have compared to U.S. national temperatures since 1988, visit our Groundhog Day page. More of Phil’s past predictions are also available from the Punxsutawney Groundhog Club.